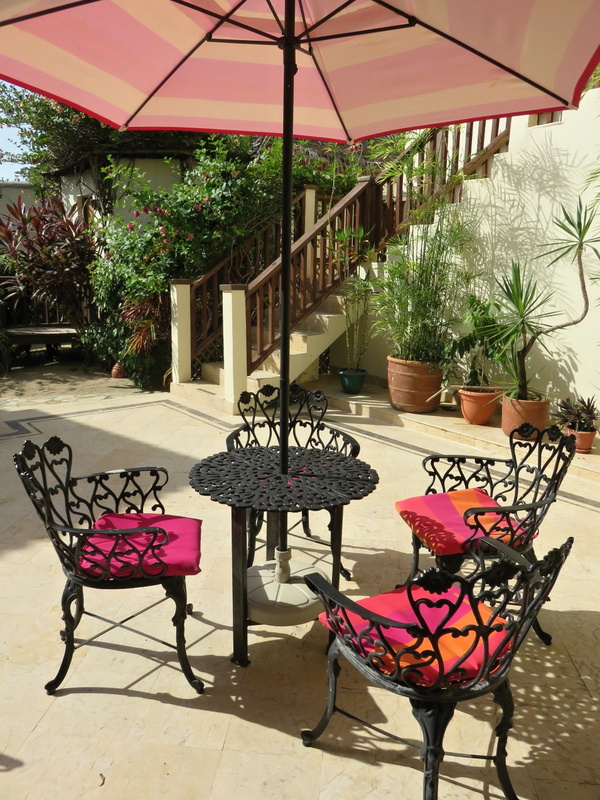 Hopkins, Belize has an enviable location. 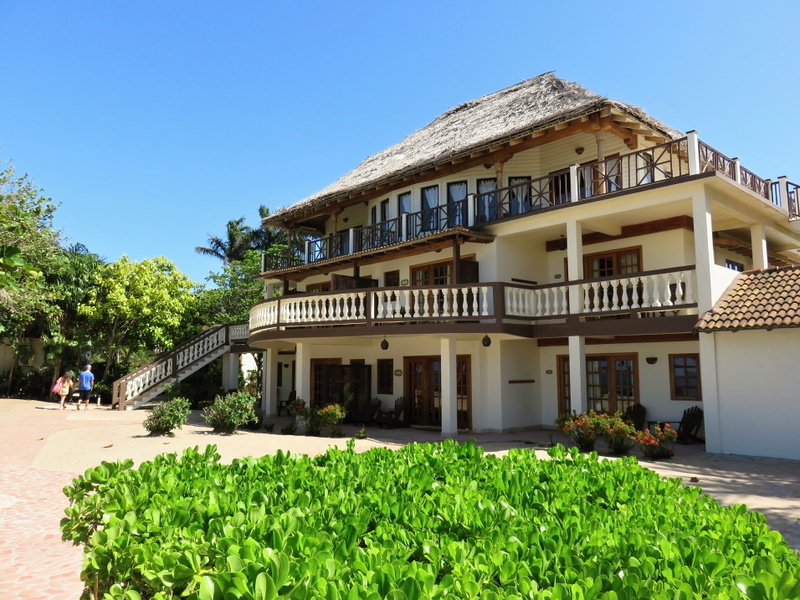 It is situated on a giant sandbar between two rivers – in the Southern Part of Belize – with the Caribbean Sea and world’s 2nd largest reef to the east and just a short drive to the west, gorgeous rivers, savannah, jungle and mountains. 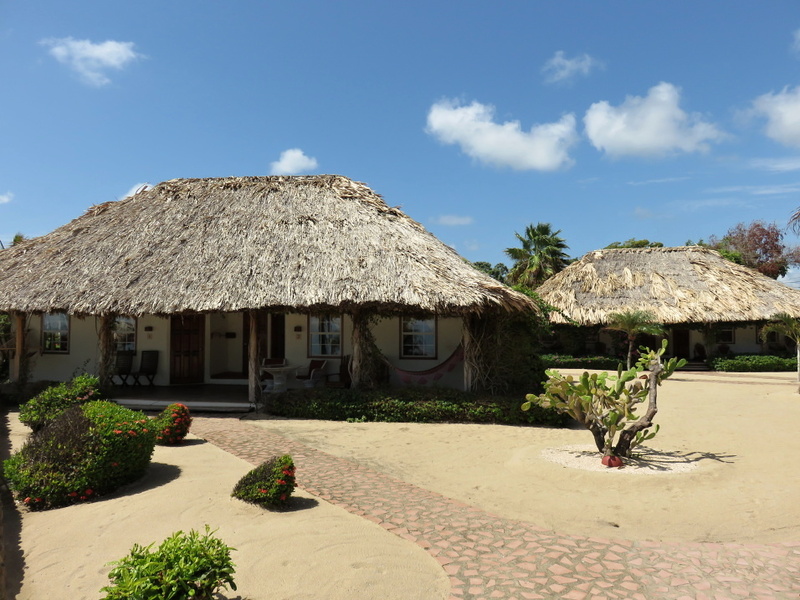 It’s also a relatively short distance to some of Belize’s biggest attractions. 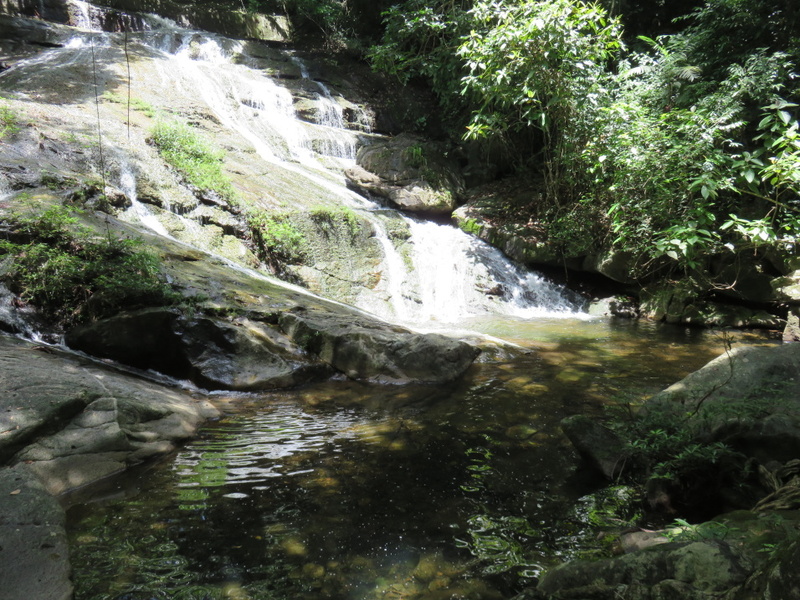 Bocawina National Park – and its zip lining (longest in Central America) and waterfall rappelling. 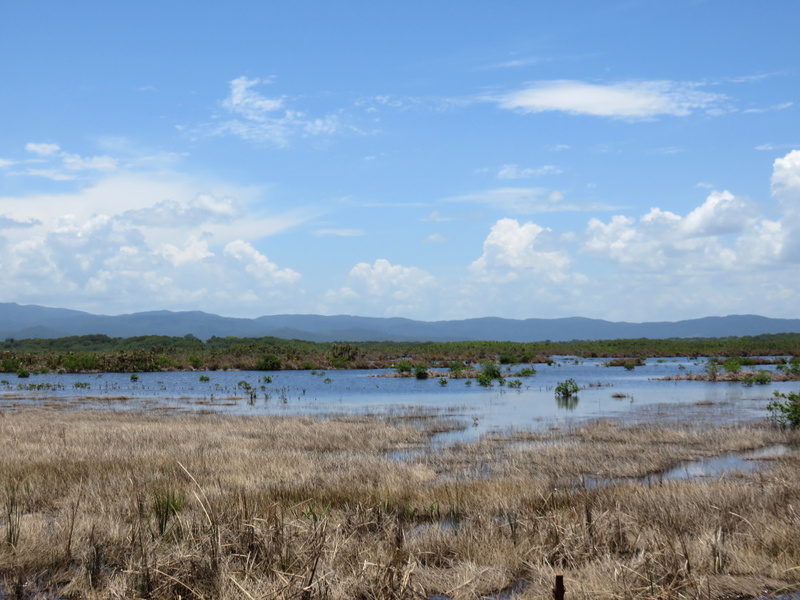 Cockscomb National Park and Jaguar Preserve. (Yes, I said jaguar.) Glovers Reef and Atoll. Maya Ruins. River tours. BIRDING! The AMAZING bioluminescence tour in nearby Anderson Lagoon. 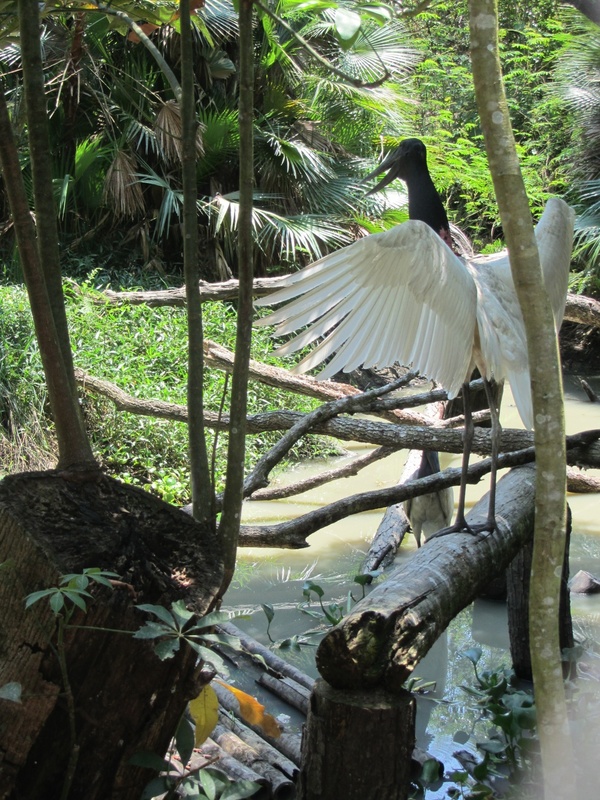 In fact, just yesterday I saw a nesting toucan, a huge red headed wood pecked and two JABIRU STORKS. Birds with 7 foot wing spans that almost don’t seem real. The savannah as you enter Hopkins Village. You almost expect to see elephants and Kilimajaro in the distance. When the rains start, this is BRIGHT green. Here is a picture I took at the Belize Zoo of one of these amazing creatures. 4 feet tall. 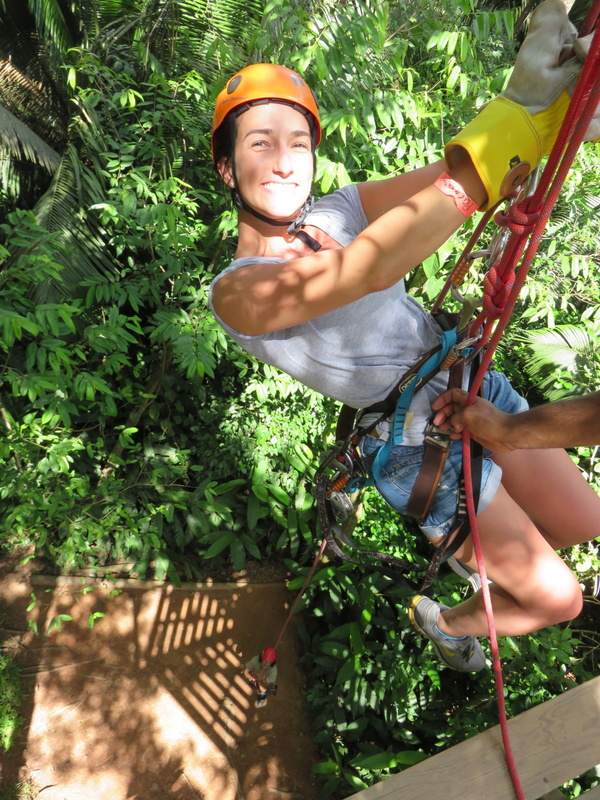 You can go zip lining and rappelling and be back in your room by 2pm. 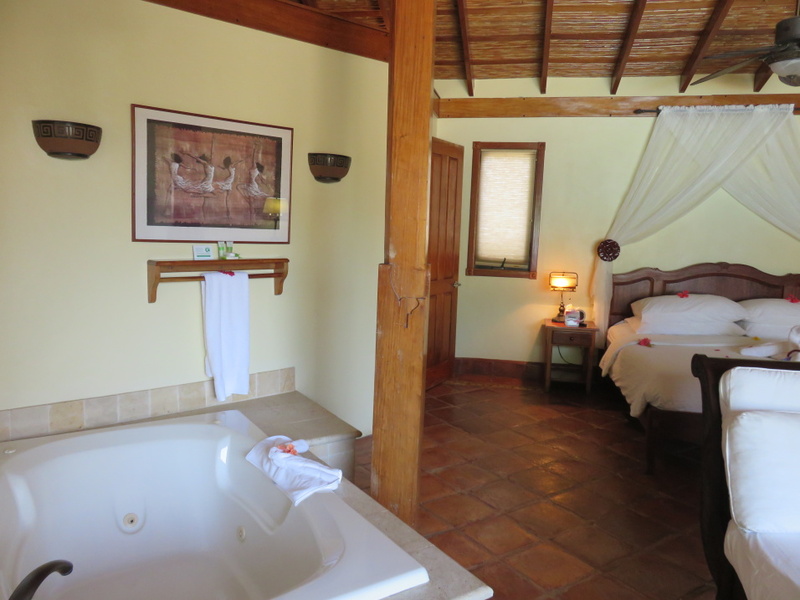 For a nap, a dip in the ocean or a walk around the village. My co-zipper Brittany. She just took the Louisiana Bar Exam and her and her boyfriend are celebrating in Hopkins. SO, as you can imagine, I was quite excited to spend 2 nights in the village. My third visit to Hopkins and both nights in the beautiful Almond Beach Resort. 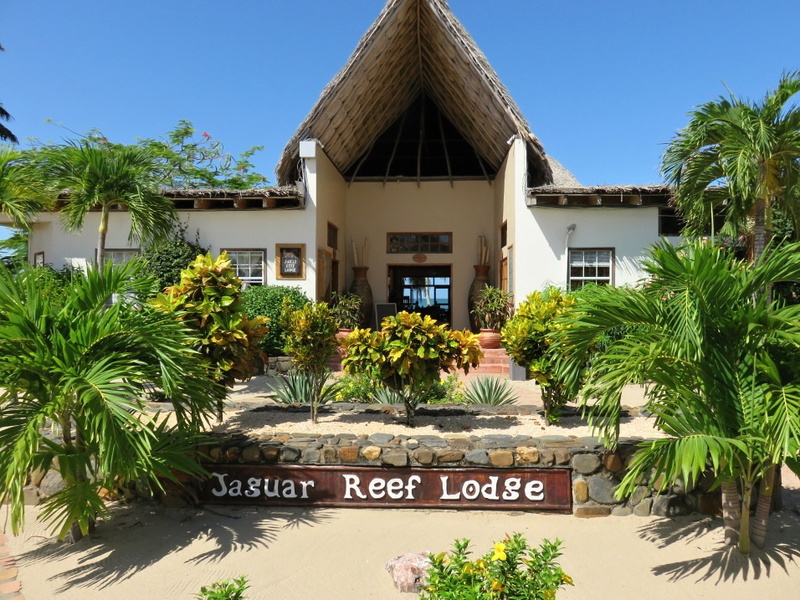 Let me show you my pictures…a look around the resort and its neighbor and sister resort Jaguar Reef Lodge. My homebase for these last few days. Just know that I am one HAPPY camper. 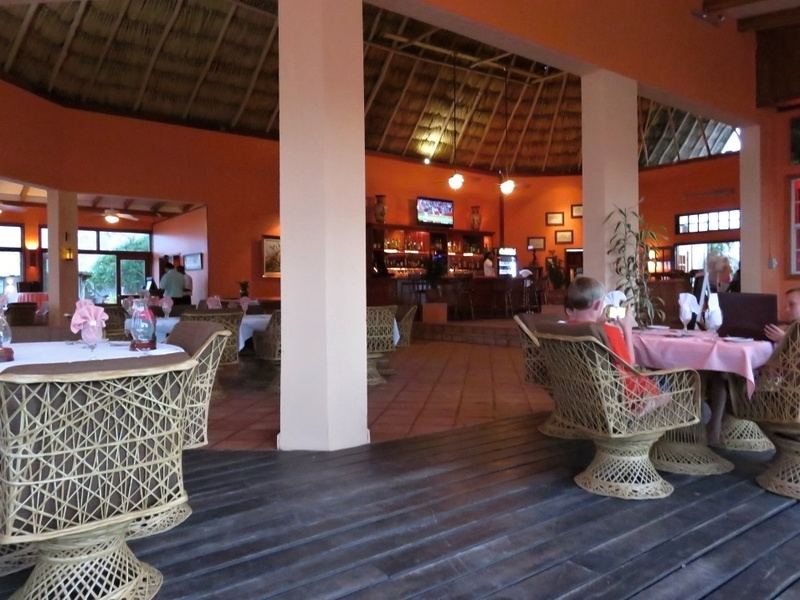 The main entrance to the huge palapa bar and dining area. 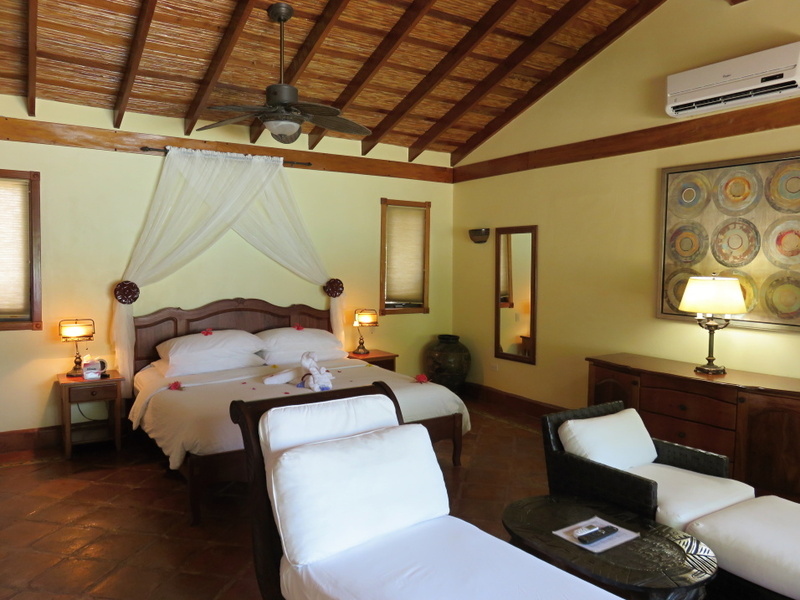 Some of the rooms at Jaguar Reef. Each front porch slung with a sun bleached hammock. The wide comfy kind, not the type that turns you into a cocoon. This pretty colonial style building. And the beach view in front of it. A picture from this morning. 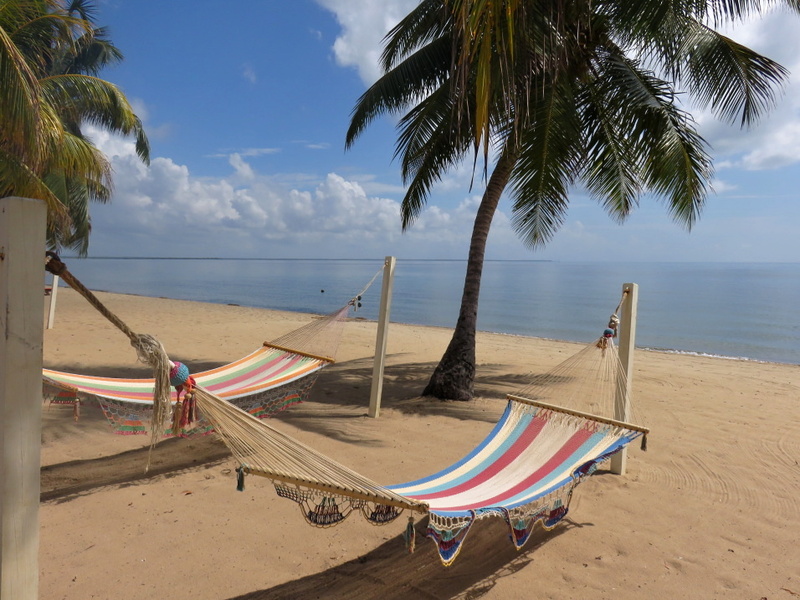 The sea is as flat and reflective as glass…perfect for the boat trip out to the reef for fishing or snorkeling. And stand-up paddle boarding. I just spotted someone SUPing a few minutes ago. And I found their secret for keeping the beach so perfectly tidy. I think it is done a few times a day. No small task, they have a long sandy strip of beach. 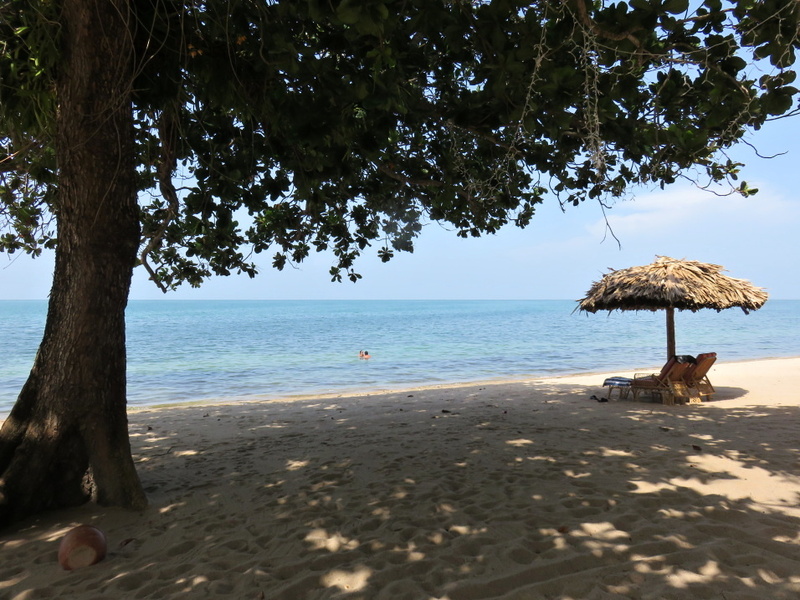 I love the full sized shade trees growing right from the sand on Hopkins’ beach. And then the beautiful infinity pool (one of two) just outside my window. With a pool bar and a stunning look out to the ocean. 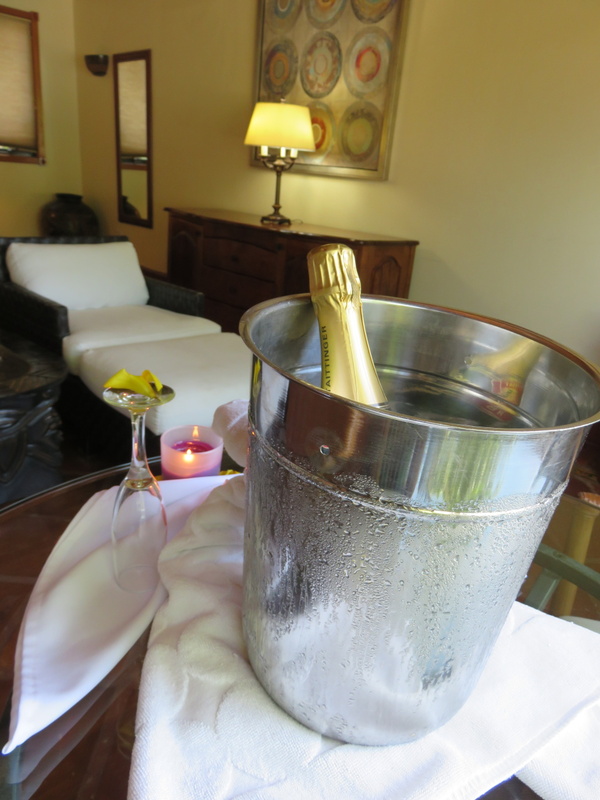 Not often that I see a bottle of Tattinger on ice in Belize. For me?!?! Huge and airy. One side of the room. I can’t even tell you how heavenly this feels after a morning of zip lining. 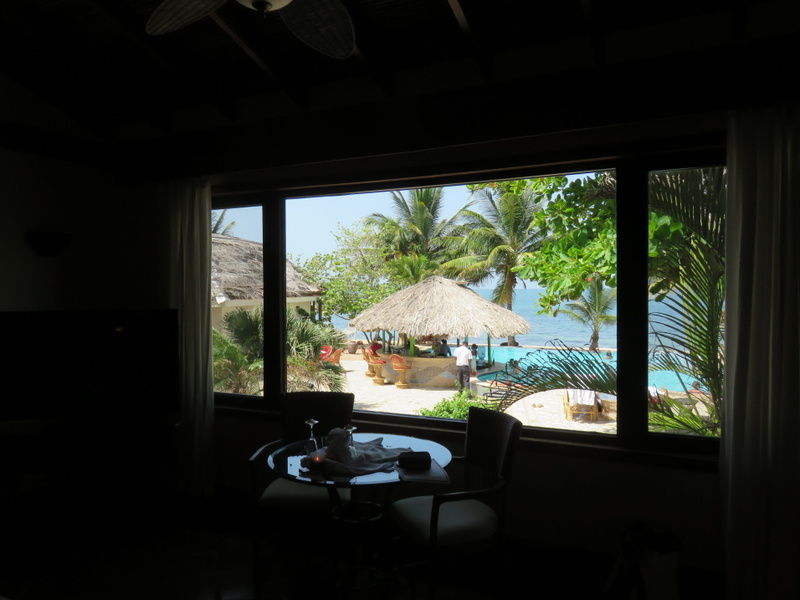 A giant flat screen tv and the view! Who needs TV…pffft. 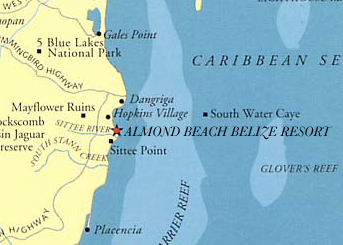 My room, like all in Almond Beach, is named after a Belizean fruit tree. 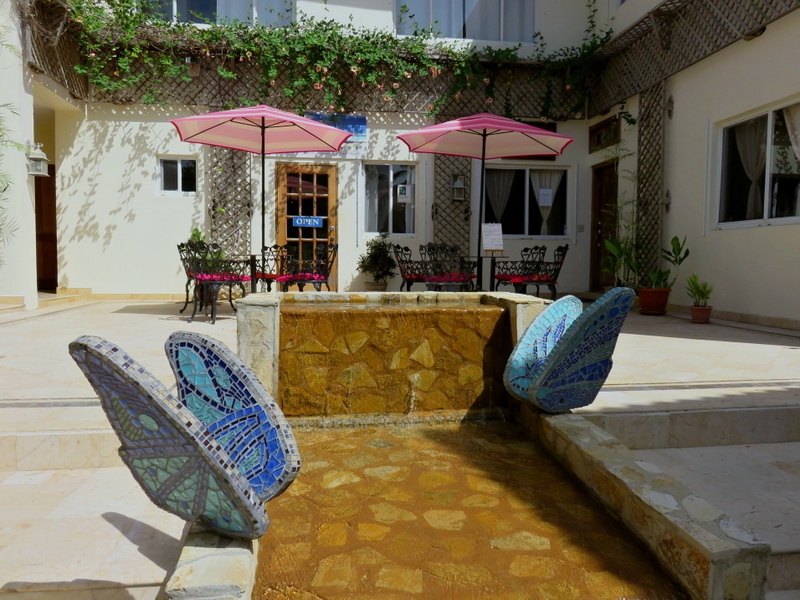 Just pass my suite, this coffee/ice cream shop (they do free tastings each day) and the Butterfly Spa. Love the mosaic work. Back to the main lodge for my first meal. 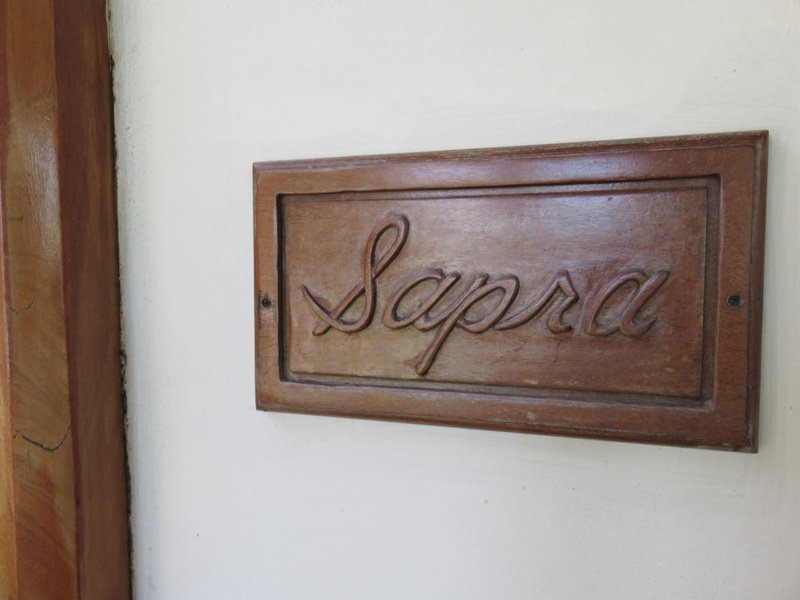 I saw this when checking in…and was thinking about it all afternoon. 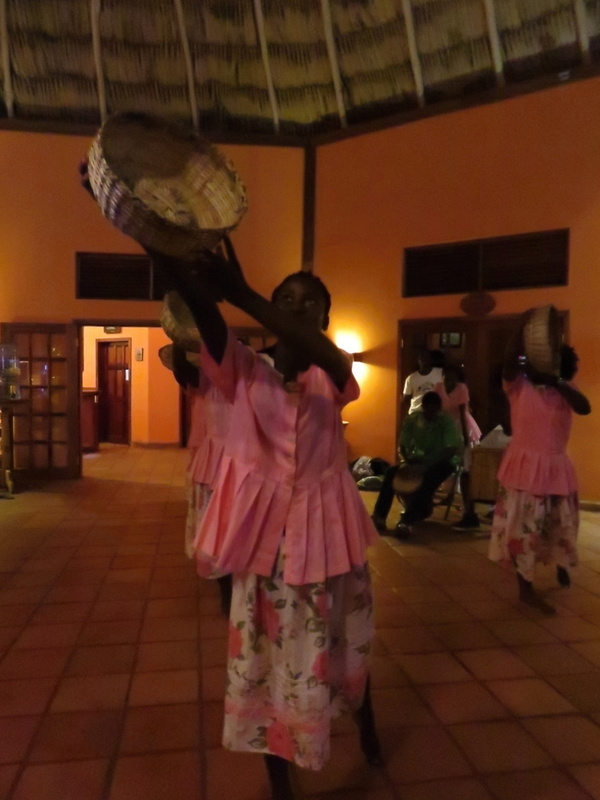 I love sere and I love Garifuna drums & dancers. I tasted sere for the first time in Dangriga when a stranger brought me to meet his grandmother to try her homecooked bowl. I was hooked. The table next to me was 4 boys…under the age of 12…acting very grown up and having dinner together. Four orders of grilled cheese sandwiches and french fries. (Ok…so not that grown up.) This place is GREAT for families and groups. And I went straight for the special. Thick coconutty, almost chowder with the classic ingredients. Okra (that was not gummy! ), cassava, sweet plantain and one not -so-classic touch. 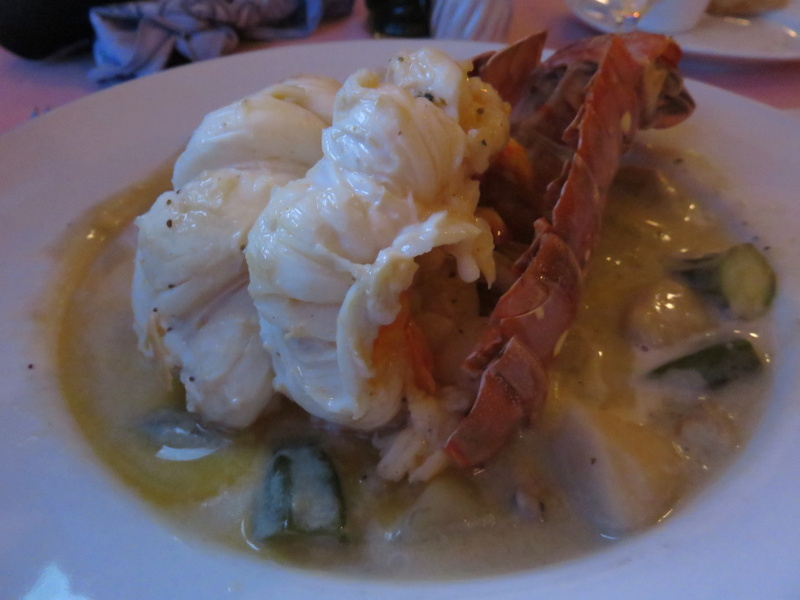 A fat perfectly cooked lobster tail. Add coconut rice and…delicious. 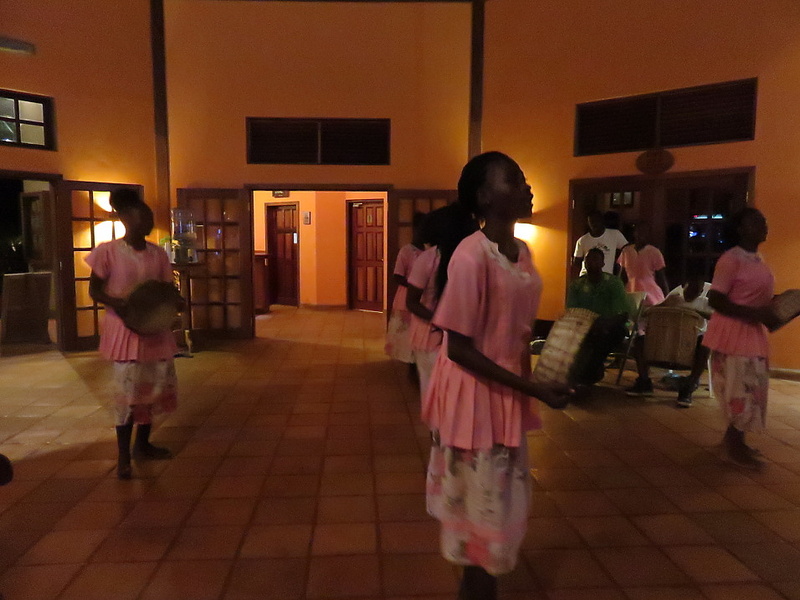 And at 7pm, the teenaged dancers and drummers lined up to perform. Wide smiles when dancing. Closed eyes and swaying heads when playing. This sort of cultural performance never fails to bring me to tears. These young adults were amazing. They invited one guest up to learn to punta. She was good! And then everyone to join in. Love it. 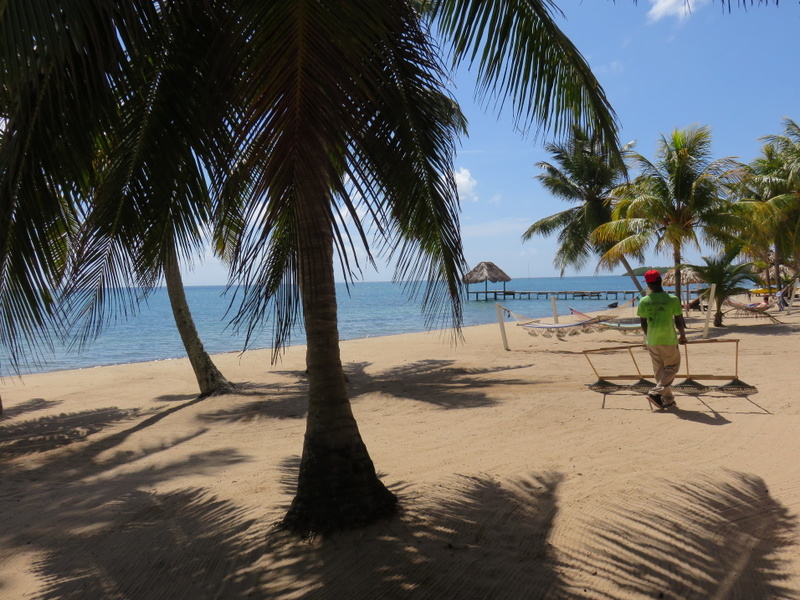 So…as you can see, Almond Beach is absolutely gorgeous. And the Hopkins area has enough culture, water and land activities to keep you occupied for an entire week…at least. 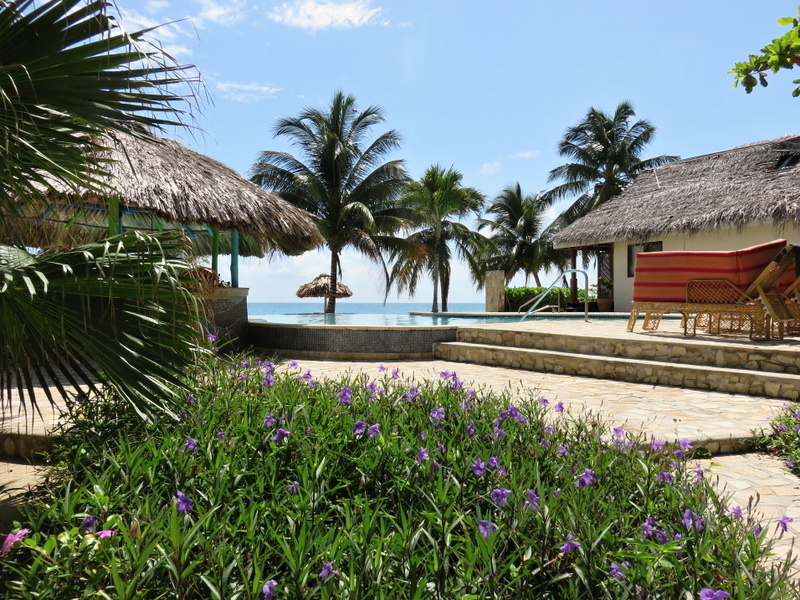 And a beautiful beach and pool if you want to do nothing at all. (Though I’m guessing you get talked into one or two of the tours.) What an absolutely gorgeous spot. I’ve loved every minute of my stay here and was wondering if I had any squatter’s rights. What happens if I just refuse to leave this suite? Probably no way to pay them back for their generous hospitality. 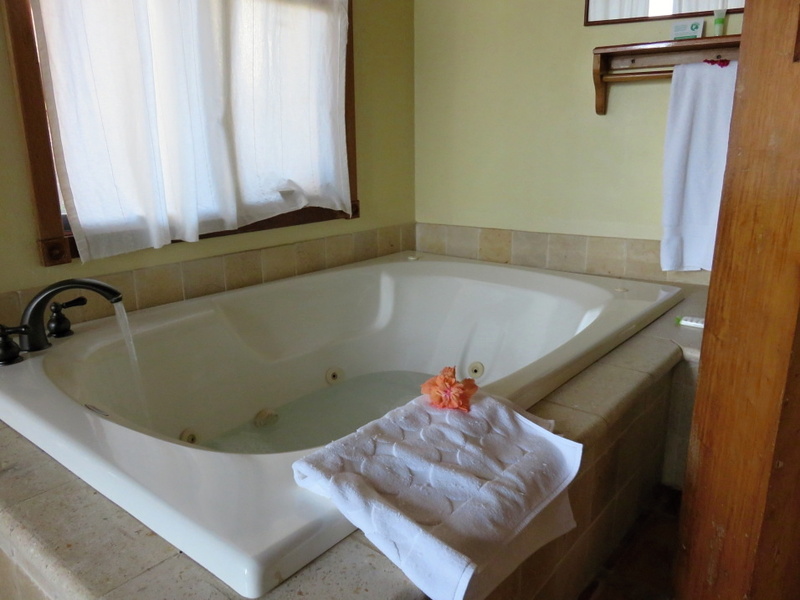 I am now about to head to Jaguar Reef & Almond Beaches’ sister resort in the foothills of the Maya Mountains – Sleeping Giant Lodge. I’m very excited. And my trip is not even halfway finished. 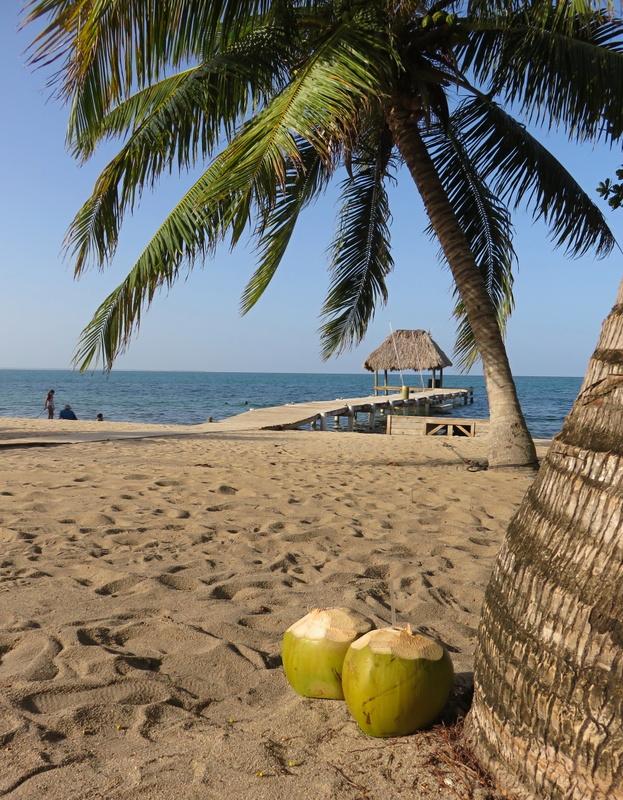 I LOVE BELIZE! 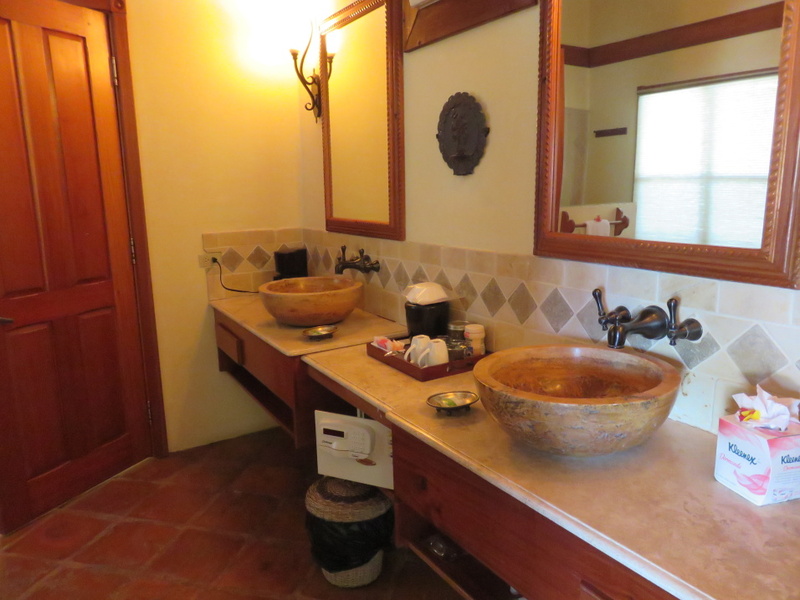 Gorgeous Villa Margarita in Hopkins, Belize and Beyond…. 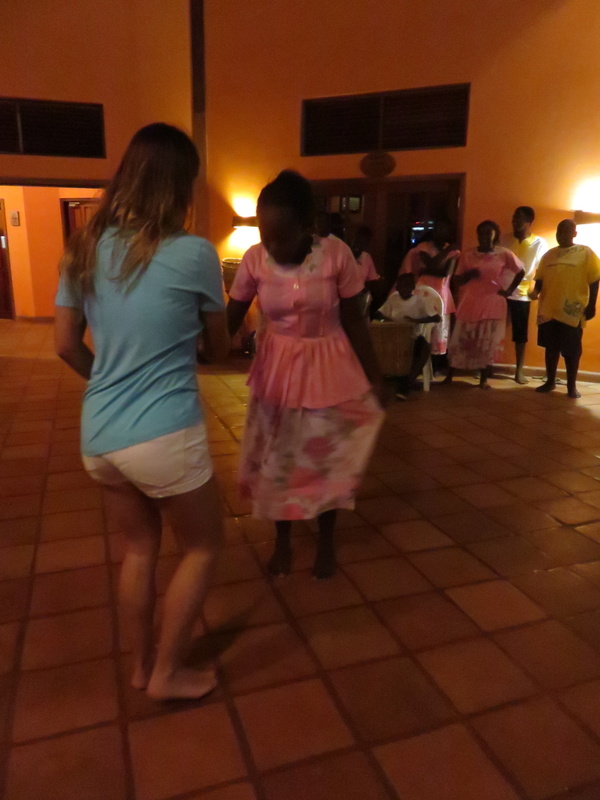 Hopkins, Belize’s Bioluminescence Night Tour: Dip Your Hand into the Burnin’ Wata! Looks absolutely gorgeous there! 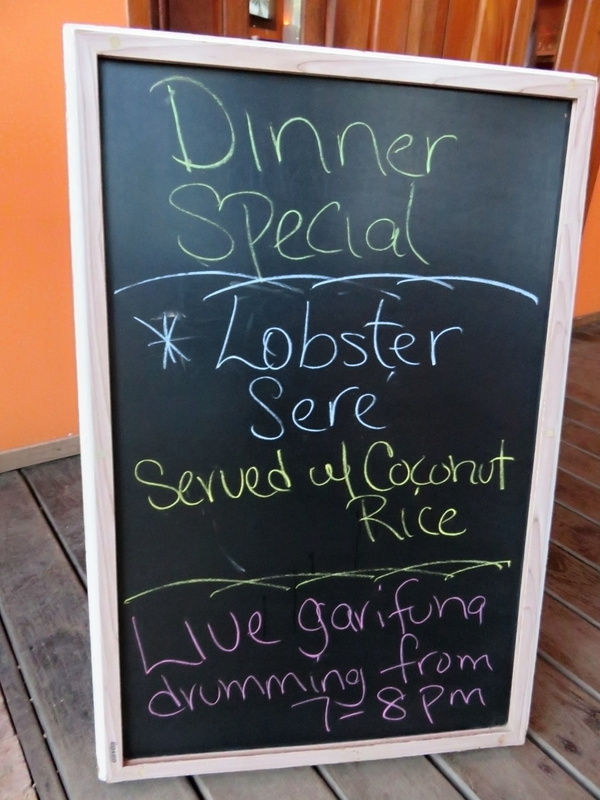 And that lobster sere…oh my! Thinks are feeling absolutely awesome right now.